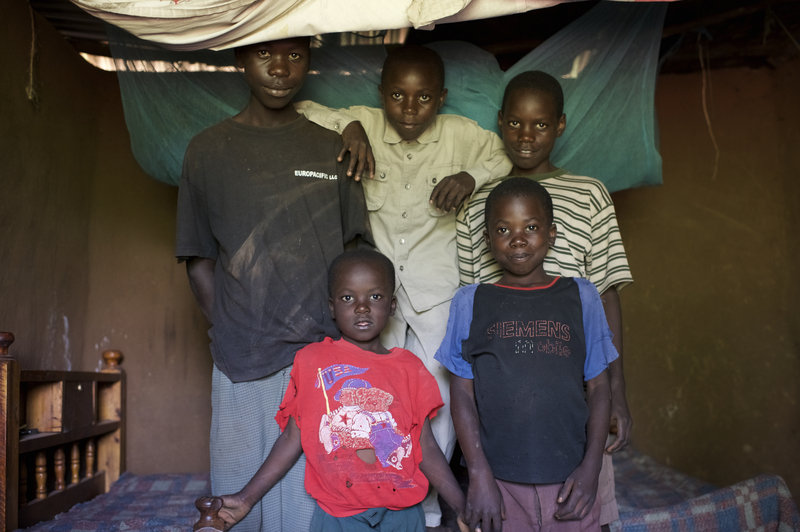 George is a young boy in the seventh grade with four paternally orphaned brothers. He lost his father over five years ago in the war against AIDS. George’s mother was then given a husband to look after her and the boys. As it turns out, they are both HIV positive, and she visits a clinic each week to receive antiviral therapy. Concurrently, she is pregnant with a sixth child to her second spouse, who does not provide for the family. Daily at sunrise, the four oldest boys, George, Stephen, Clifton, and Brian, walk hurriedly together for LightHouse Academy. The journey takes over an hour, through the hills and under the hot Kenyan sun. There, they find the only consistent food and clean water in their lives, learning and singing along with their classmates. After a full day of classes they face another adventure returning home. The boys have only one hour of daylight to complete any schoolwork before it is too dark to read. The bed George and his brothers all sleep on together, laying sideways so they all fit. After sunset, the four eldest sleep together on one bed, lying width-wise with their legs hanging off the edge. Brighton, the youngest, shares a bed with his mother. On weekends, the young boys show tremendous entrepreneurial spirit and make rope from sisal leaves, and burn trees to make charcoal. They sell both products to buy and plant seeds to grow food in support of their family. Clifton, who is only in sixth grade, is also reponsible for taking care of their neighboring grandparents. A day of making charcoal will yield 100 Kenyan shillings, or the US equivalent of earning $1.15. A few bundles of rope produce half that sum, enough for a large bottle of Coke. Their mother supports Rafiki’s vision entirely, knowing that her boys’ only hope for a promising future rests entirely on the education they receive at LightHouse Academy. UPDATE: Because Rafiki recognizes the interconnection of people and the environment, we no longer support the burning of trees to make charcoal. Drought is a huge problem in Kenya, and destroying trees, which bring rain and purify water, makes this issue worse. We work with families of our students to find other sources of income, and all students at LightHouse Academy receive environmental education and hands on experience.